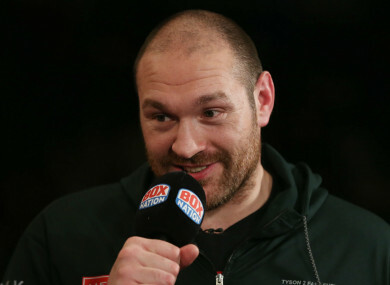 Fury does not intend to apply for a new licence from the British Boxing Board of Control. FORMER WORLD HEAVYWEIGHT champion Tyson Fury will not re-apply for a licence to fight from the British Boxing Board of Control (BBBofC). Fury had his licence revoked in October 2016 after allegations of doping were made against the 29-year-old earlier in the year. His hint at a comeback in March never materialised and Fury has sent out mixed signals about his future in the sport in recent months. The Briton has suggested that he will instead look to acquire a licence through alternative means, although his attempt to do so through the Boxing Union of Ireland was reportedly turned down in March. “After thinking long and hard about my return I will not be applying for a BBBofC boxing licence,” he tweeted. He added in a further tweet that he plans to seek a licence elsewhere. @TheCannonBriggs I'm gonna give you the best whooping ever,it'll be like a ❤️Making beating. Long & slow with lots of time to play. Fury has not fought since November 2015, when he claimed the IBF, WBO and WBA heavyweight titles in a shock victory over Wladimir Klitschko in Dusseldorf. The BBBofC has previously said it will not reinstate Fury’s licence until the conclusion of the fighter’s UK Anti-Doping hearing, the delay to which has drawn criticism from Fury. The 29-year-old was also left incensed with the BBBofC following his cousin Hughie Fury’s defeat to WBO Joseph Parker in September. Email “Tyson Fury says he won't re-apply for British boxing licence”. Feedback on “Tyson Fury says he won't re-apply for British boxing licence”.